With a little forward planning your itchy little one can be a water baby too. Swimming is great for all babies and for an eczema baby there are additional long and short-term health benefits including better sleep, stronger lungs (eczema babies have a higher risk of developing asthma) and reduced bacterial infections in eczema damaged skin. But we know from experience that the thought of taking an eczema baby to swimming lessons can be very daunting so we’ve collected our top tips to minimise itching and maximise fun in the pool. Swimming has been proven to strengthen the heart and lungs. Eczema babies have a relatively high risk of developing asthma. Developing strong lungs and the ability to control their breathing can help to control asthma symptoms. Children who undertake physical exercise will sleep better. Eczema babies can really struggle to sleep through the itch, so anything that helps them sleep can only be good. Spending time in cool water can calm angry skin and surprisingly pool chemicals can actually be beneficial for some babies’ eczema, especially if your baby’s eczema is prone to infections. If your baby’s eczema is aggravated by water, using a barrier cream will help. It’s also worthwhile reading our article on eczema friendly laundry as this is a classic symptom of detergent allergies. Interacting with other babies in swimming classes, learning to take turns and to praise the efforts of others all instill good social skills. Once eczema children become aware of their skin condition they can start to struggle socially. Developing these skills early, before they are aware of their eczema, can be a real benefit to eczema children. As with all things related to baby eczema, working out what works for you and your family really is a case of trial and error. But apart from being a lot of fun for both you and your eczema baby, baby swimming has very real benefits so it really is worth being brave and taking the plunge. Check pool cleaning system: The most common pool chemical is chlorine and the busier pools will have higher concentrations (especially those in holiday resorts). Chlorine dries the skin so can aggravate baby eczema, so it is really important to shower off the pool water after swimming and slop on the moisturiser. However, chlorine can also be beneficial for inflamed eczema as it kills the bacteria responsible for infections. Ozone pools are kinder on skin as they don’t have the same drying effect but it’s still a good idea to shower off the pool water after swimming. Salt water pools are less common but are kinder again on eczema as the salt softens the water and appears to be beneficial in some cases – although it can really sting if your little one has unhealed scratches or lesions. 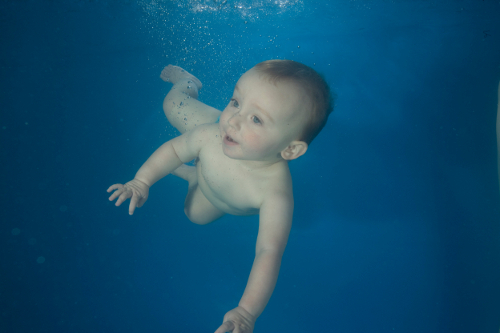 Find a cool pool: Baby swimming lessons are often held in relatively warm hydrotherapy pools. While this is good for most babies, eczema babies may do better in cooler pools as the warmer water can dry out skin more than cooler water. Eczema babies may also find that heat of the water combined with the warmth of an eczema swimming suit can make them itchy. Moisturise before and after swimming: Protect skin from drying pool chemicals by applying a layer of moisturiser or barrier cream before getting in the pool. On really scratchy days, we did this before we left home to give the moisturiser time to sink in. If your baby has unhealed scratches it’s worth putting a smear of Vaseline or barrier cream over them just before you get into the pool to keep the water out. When you get out of the pool, shower off thoroughly and re-apply a good layer of moisturiser. It can be worth taking a baby-grow to put on over the moisturiser and changing your little one into regular clothes when you get home. Talk to your doctor if you’re not sure about which cream to use, our doctor prescribed small tubes of our regular moisturiser to keep in the swimming bag. Cover up: Baby eczema is really itchy, so you’ll need to keep the really uncomfortable areas covered to prevent your baby scratching. While there are baby swimming suits specifically designed for eczema babies , we found that a cheap sun-suit from the supermarket or baby wetsuit (we like the ones with arms) did the trick just as well for our son. Covering up also helps you keep a firm grip on your freshly moisturised baby and means that the barrier layer doesn’t get rubbed off so quickly. Another benefit of covering up is that it will protect your baby from the rough surface of well-used swimming floats. Keep hands busy: If your baby is really scratchy in the water, try keeping their hands busy with a bath toy. Baby swimming teachers will have plenty of different toys available. Plan your exit: Eczema babies will make the most of any opportunity to scratch. Being dried, moisturised and dressed provides just that opportunity. If you can, leave your bag in the changing room (rather than in a locker) with the towels on top, so you can get your baby wrapped up as soon as you get out of the shower. We found that the hooded towels with the hood in the centre of the long side (rather than in the corner) worked best as we could have our itchy son out of his swimsuit, securely wrapped and warm with minimal scratching while we sorted out creams and clothes. As he got older, we kept his hands busy with a bottle of milk and now we give him a fiddly box of raisins. And finally, a tip learnt the hard way: we have really big towels for us so that we don’t get cold while we sort the kids out. Try using SplashSleeves: If your little one is more interested in scratching than splashing about, try using our SplashSleeves to keep their hands covered while they are in the pool. These will minimise any damage they are able to do without getting in the way of the fun. Most baby swimming teachers will be more than happy to arrange a taster session so that you can work out if the pool chemicals agree with your little one. Baby eczema is sadly very common so in all probability, they will have taught other eczema babies and will understand how to teach your little one. For babies with mild to moderate eczema, it should be possible to find a way for them (and you) to really enjoy swimming. However, if your little one has really severe eczema it would be wise to wait until it is under control before venturing into the pool for the first time. If you are in any doubt, ask your dermatologist. Our eczema baby loved being in the water. Does yours? Visit Great Things to Teach Eczema Babies & Kids for more articles like this. Here at ScratchSleeves we don’t just share our experiences of bringing up an eczema child and favourite allergy friendly recipes, we also manufacturer and sell our unique stay-on scratch mitts and PJs for itchy babies, toddlers and children. We now stock sizes from 0-10 years in a range of colours. Visit www.ScratchSleeves.co.uk for more information.